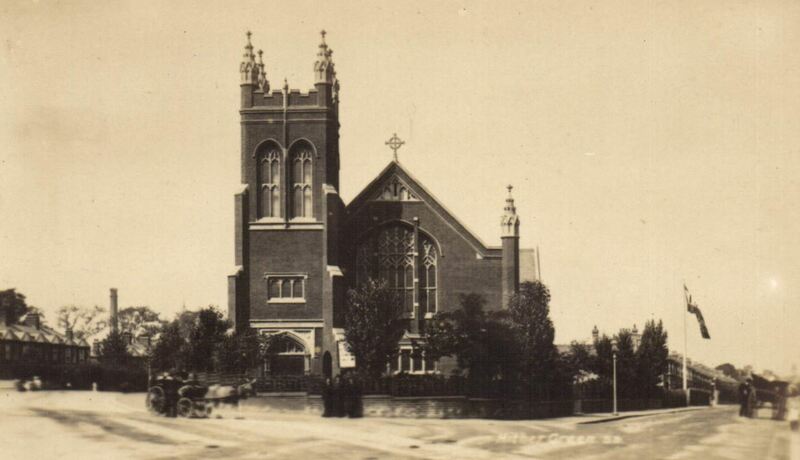 The Church had an impressive position on the angle of Wellmeadow Road and Hither Green Lane and was part of the St Germans Estate, now generally known as the Corbett Estate, it was one of seven places of worship built on the Estate – although there were no public houses or off-licences. The foundation stone was laid in July 1899 and completed the following year at a cost of £4,800, and accommodated 700 worshipers. The building work was carried out by C. Castle & Son of Lower Clapton, little is known of them other than it was may well have been the son, Frederick William Castle, who was carrying out the work. The firm went ‘bust’ in 1911 when Frederick was living in Alcester Crescent in Lower Clapton trading out of Milton Works Shacklewell Lane in Hackney. red brick with stone dressings in the 16th century Gothic style with heavily traceried windows and a tall pinnacled tower. The interior consisted of a nave, two aisles, a transept, chancel, organ chamber and galleries on three sides. Its architect was Josiah Gunton was born in the tiny Fens village of Manea, about 4 miles north west of Ely in 1862. In the 1871 census he was 9 and living with an elder brother, William, and his father, also Josiah who was a farmer. His mother died just before the census was carried out. In the 1881 census, he was lodging with the Collard family in St Phillips Road in Hackney and was listed as an Architectural Assistant. He isn’t recorded in either the 1891 or 1901 censuses but married Jessie Runchman from Hackney in 1886, it was probably his second marriage as both his children pre-dated the marriage and his staunch Wesleyan Methodist views would have no doubt ‘prevented’ having children outside wedlock. They probably stayed around East London – he was captain of Walthamstow Cricket club in in the late 1880s. By 1911 he and Jessie were living at 23 Orchard Road in Bromley and had two children still at home who had been born in Hackney two decades before, and along with 3 servants. Josiah Gunton was articled to the firm Gordon & Lowther and was taken into partnership in 1885. After the death of Lowther in 1900, the practice continued as Gordon & Gunton. William Henry Gunton, Josiah’s son who had been born in 1881 joined as partner in 1916. Josiah Gunton designed many Wesleyan chapels but the firm Gunton & Gunton tended to specialise in commercial buildings after World War I.
Gunton was a City of London Alderman, having initially been elected for Coleman ward in 1904. He was a member of the London County Council for the Municipal Reform Party (allied to Conservatives) from 1928 until his sudden death on 5 March 1930 at Hotel Metropole, Monte Carlo, Monaco. There were suggestions that but for his death he might have been elected as Lord Mayor. The church was destroyed during a raid on the night of 11 September 1940, which also caused a fire a few hundred metres up the road at the Park (later Hither Green) Hospital. It is not clear why some local churches destroyed in WW2 were rebuilt, such as the Good Shepherd in Lee, but others such as Holy Trinity in Glenton Road and Christ Church in Lee Park weren’t – the latter two have both already been covered in Running Past. Hither Green Methodist church was one of those that were never rebuilt. The congregation seems to have largely moved to another Methodist church on the Corbett Estate – what was then known as the Benson Memorial Church on Torridon Road. The site of the church was redeveloped for council housing after World War Two which is known as Littlebourne – while they are flats that, from the outside at least, have stood the test of time well, and been on the site much longer than the church, they are perhaps not quite so impressive looking. The Benson Memorial Church suffered bomb damage in 1944, possibly as a result of a V1 attack on 4 August which hit Arngask Road, which was opposite the church,although it was initially reported as hitting Torridon Road. The congregation had to move into the neighbouring church hall. The Benson Memorial Church eventually became known as Hither Green Methodist Church and remained in the church until 1995 when it was sold for housing. The hall was modified and refurbished as both a hall and church in 1996. 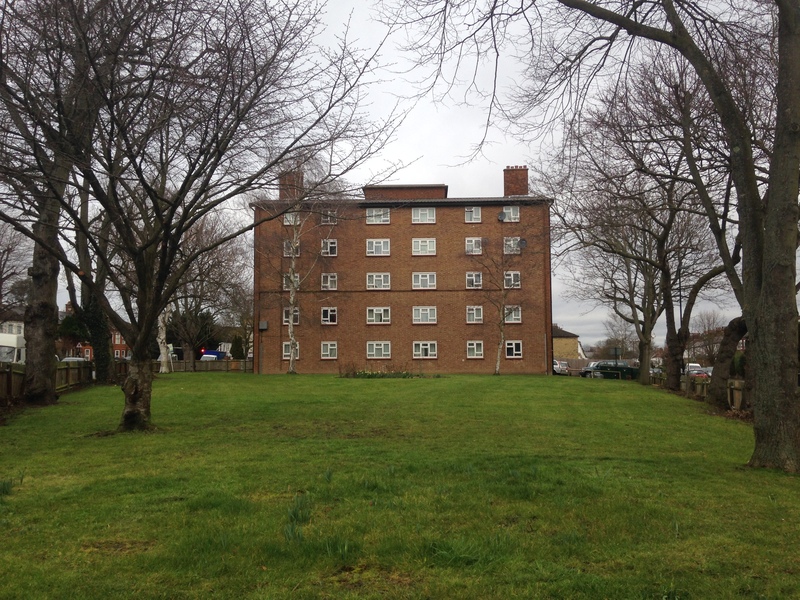 This entry was posted in Lewisham History and tagged Corbett Estate, Hither Green Lane, Hither Green Methodist Church, Josiah Gunton, Wellmeadow Road on March 17, 2016 by Paul B. Thank you for the article. For an interesting article on John Wesley’s Foundry Church building in London, please visit the article on this subject at: https://www.francisasburytriptych.com/john-wesleys-foundry-church/. Enjoy. Benson Memorial Church was built by the United Methodist Church and the Hither Green Lane church was, I presume, built by the Wesleyan Methodists (looks too fancy for any other branch of Methodism). Most strands of Methodism combined in the early 1930s to form The Methodist Church, but individual congregations carried on in their old buildings. Restrictions on building, due to shortages of materials and labour, continued after the war so by the time it would have been feasible to rebuild the Hither Green Lane church it would have been one congregation (whatever the paperwork might have said). That’s really helpful Bill; given the Methodist traditions within my family I ought to have known some of this. I will do an update to the post at some stage using your comments. Thank you. Does anyone know the date for the image of the church? We are trying to put a rough date on some of the photos we have of where our girl guiding unit met. Most of the postcards like that were Edwardian or just after – so probably somewhere around 1905 – 1910.